There’s no denying the New York Islanders waited too long to handle things with John Tavares. Not necessarily the contract talks, but the host of issues that led to his agent, Pat Brisson, urging Tavares to meet with teams during the interview period and listen to their pitches before making a final decision. We don’t need to cover the entire saga here, as its been covered ad nauseam, but it’s worth a brief comparison to the situation with Connor McDavid and the Edmonton Oilers, especially in light of his recent post-game interview. As the saying often attributed to Mark Twain goes, “History does not repeat itself, but it does often rhyme,” boy, are the Oilers becoming poets. Between the revolving door of coaches (three in nine years) and wingers (of which there were too many to count, not to mention the the continuing arena story, there was never a sense of structure for Tavares on Long Island. To make matters worse, the Islanders never seemed to have the ability to be honest with themselves about where they were as a team. Even as they lacked direction heading into the 2011-12 season, Tavares signed a very team-friendly six-year extension, leaving room for the team to build around the star center. While they ultimately never added the pieces necessary to form a perennial contender, Tavares willed the Islanders to three playoff appearances, which included back-to-back 100-plus point seasons, and even scored the game-winning goal in the 2016 Playoffs to give the Islanders their first series win since 1993. “First of all, this has been the best experience of my life. I mean that sincerely. To be able to coach in a market like this where it means so much has been just an unbelievable experience. There’s no use in speculating who may be behind the bench next season and beyond, but, as McDavid alluded to in his recent interview, it’s difficult to think about the future with so much in transition on and off the ice. On top of that, the Oilers have not yet named a general manager to replace interim-GM Keith Gretzky. 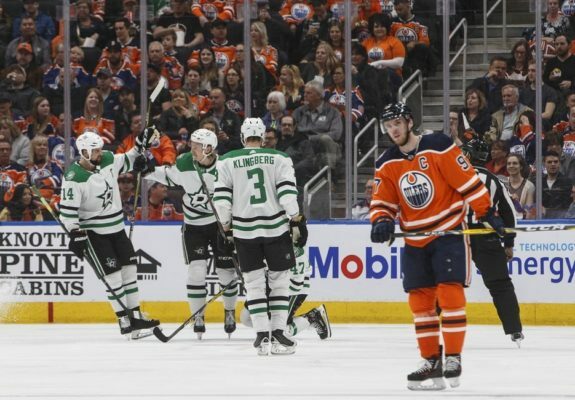 Reports have a number of people the Oilers are looking at to potentially fill the position, but, again, how can any player on the roster feel comfortable about the future of the organization right now? Additionally, former Oilers general manager, Peter Chiarelli, traded away many of the team’s assets in one-sided deals. So not only were players being swapped every season, making it difficult for McDavid to form chemistry, the incoming players were simply not good enough. Yet, number 97 still managed to drag the Oilers all the way to game seven of the second round of the 2017 Playoffs. What should give Oilers fans hope is the quick turnaround the Islanders have gone through this season. There weren’t a lot of on-ice additions on the Island, rather, it was the front office and coaching staff that got an overhaul, which has proved to be a key factor. There was hope that Hitchcock could be the change the Oilers needed, but, as many have noted, the problems in Edmonton are beyond an early season coaching change, even one that included one of the winningest coaches in NHL history. On Long Island, general manager Lou Lamoriello created a culture of professionalism that the young cast of Islanders clearly needed. Lamoriello also brought in additional veteran role players to help teach those with less experience, though, early on, it wasn’t clear it would work. Coach Barry Trotz and his coaching staff brought a winning pedigree to the locker room, one that the players have bought into, helping to lead the Islanders back to the playoffs this season. It won’t be easy for the Oilers to find a coach and GM that can get them to where the Islanders are this season, but stranger things have happened. The other piece of good news is that McDavid is already locked up long-term, along with fellow star Leon Draisaitl, a pretty decent pair to rebuild a team with. While these situations aren’t exactly the same, there are a lot of parallel storylines. However, ultimately, like Tavares, McDavid has the upper hand in the situation, though there are differing opinions on whether the forward would ask for a trade, but that’s a story for a different day.